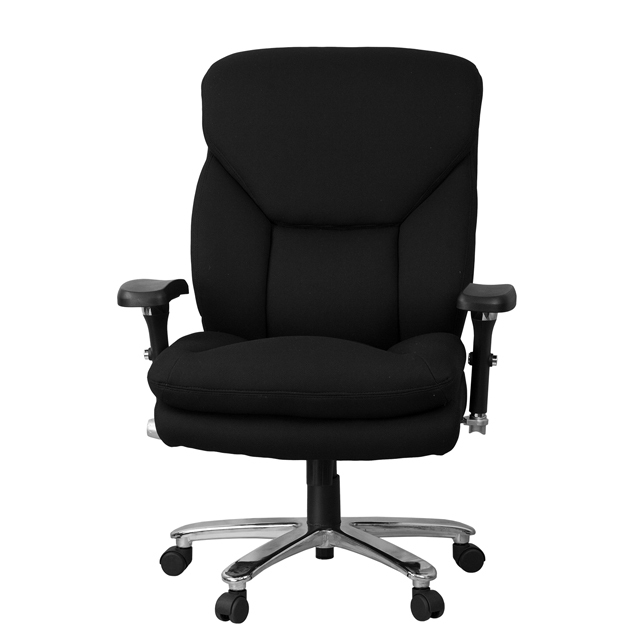 Min Arm Height From Floor 26"
Max Arm Height From Floor 32.5"
Min Arm Height From Seat 4.5"
Max Arm Height From Seat 7"
This Big & Tall Executive Office Chair is an ideal chair for larger and taller professionals who spend long hours sitting behind a desk. An extended upper back with integrated headrest supports your neck, and the pressurized lumbar support knob allows you to increase and decrease lumbar support. Height adjustable arm rests let you position them at the best height to support your shoulders and neck. The 25" wide swivel seat is double padded with 4" of foam and has a waterfall edge designed to reduce leg strain and promote healthy blood flow to your legs. Raise or lower the seat using the pneumatic height adjustment lever for a custom fit. Turn the tilt tension adjustment knob to increase or decrease the amount of force needed to rock or recline and lock the seat in place with the tilt lock mechanism. This sturdy chair has a heavy duty chrome base, smooth-rolling dual wheel casters and a 400 pound weight capacity. Whether you're buying chairs for a 911 dispatch office, call center, or control room, this 24/7 intensive use office chair is the right chair for the job, especially in a multi-shift environment.